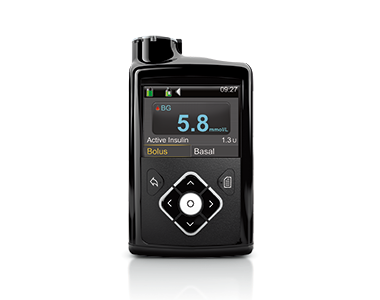 SmartGuard® Auto Mode™ to personalise Basal Insulin Delivery every 5 minutes, 24 hours a day. Linked Blood Glucose Meter to save time and avoid errors. Predictive alerts notify you before you go high or low, so you can take action sooner. Set your alert to audio or vibrate. Both can occur simultaneously on the MiniMed® 640G. The pump has 8 basal patterns for increased customisation. The pump has 3 basal patterns to choose from. The pump's Bolus™ delivery speed is adjustable: 1.5 U/min (standard speed) or 15 U/min (quick speed). The Bolus™ delivery speed is fixed at 1.5 U/min. The pump has no present Bolus™ values. The CONTOUR™ NEXT LINK 2.4 is the only available meter designed to communicate wirelessly with the MiniMed® 640G. The CONTOUR™ LINK connects wirelessly with the Paradigm Veo and automatically sends your blood glucose results4. The pump can deliver a manual or pre-set remote Bolus™ from the meter. This feature can be used to cover frequently eaten meals or snacks. Avoid errors and enjoy carrying out your routine tasks with ease. Enhanced user interface for fewer button pushes, back button and navigation by alerts. Larger, clearer display with a 4cm (wide) x 3cm (high) screen. Simple user-friendly menus, back button and navigation by alerts. 4.5cm (wide) x 1.8cm (high) screen. The pump lets you customise up to eight different glucose target ranges, so you can receive alerts that prompt you to act. Easily insert your sensor and wear it without discomfort. The pump automatically stores 10 hours of missed glucose readings. The pump automatically stores 40 minutes of missed glucose readings. CareLink™ Personal therapy management software helps you and your doctor discover trends and patterns, so you can tailor your treatment plan. Using CareLink™ has been shown to help lower your A1C levels11. Whilst using the MiniMed®Paradigm Veo, insulin delivery is suspended while data is uploaded to Carelink. For uninterrupted insulin delivery, the MiniMed® 640G does not suspend delivery while data is uploaded to Carelink. Medtronic has over 30 years of experience in diabetes education and management, a 24-hour helpline, global assistance, Web resources and an active online social community. Manually injected insulin will not be tracked by the pump. Battelino T, Conget I, Olsen B, et al. The use and efficacy of continuous glucose monitoring in type 1 diabetes treated with insulin pump therapy: a randomized controlled trial. Diabetologia. 2012;55:3155–3162. Enlite™ Sensor Performance Clinical Appendix. with type 1 diabetes mellitus. Pediatric Diabetes. 2008;9(Part II):360–366.